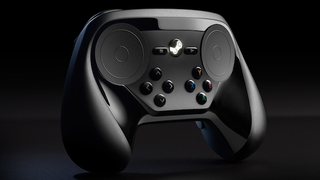 Valve just sent us this image, a more clear depiction of the latest Steam Controller prototype that they detailed back in January. Likely in the interest of backward compatibility, this latest prototype has eight clear buttons on the front, which will doubtless make it easier for the controller to support Xbox 360-style XInput controls. It'll be at Valve's booth at GDC next week, where I'll be sure to check it out. For more on Valve's process designing the controller, check out this Q&A with one of the project's designers.